Excellent VALUE on this CUSTOM designer full brick home in prime location to all the Rock Barn amenities.. 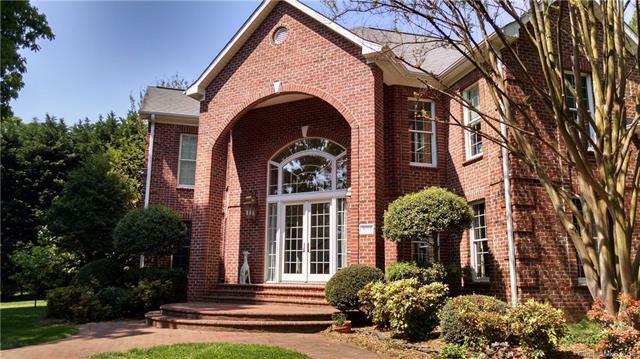 Sitting on a corner lot along the 17th hole of the Jackson course, this Rock Barn home features a dramatic entry foyer with a grand almost famous chandelier and double staircase. The 2 story Great Room with fireplace opens to a lush private backyard patio and arboretum with waterfall fish pond. Master on main features back patio access, large master bath with two vanities, walk in closets and whirlpool soaking tub. Kitchen includes granite, stainless appliances, center island and large breakfast area with golf course views. Main level also features a dining room and library/study with built-ins. Upper level includes two bedrooms and a full bath with whirlpool tub and large bonus room perfect for a den or exercise area. Plenty of storage space in the walk-in attic areas. Rock Barn Country Club boasts two golf courses, spa, fitness, clubhouse, pool, tennis and much more! Offered by Stable Real Estate Llc. Copyright 2019 Carolina Multiple Listing Services. All rights reserved.